A disciple is more than just a learner. Disciples are people who put what they are learning into practice. It is a kind of on-the-job learning which never ends. These are the first two marks of discipleship; a disciple is a student of the Way and a person who lives the Way. Most people discover that the type of knowledge we acquire from doing resonates within our being more than knowledge we acquire in other ways. Our Lord today is still Jesus who teaches us through the Holy Spirit. He told us he would send us a new advocate who will teach us everything and remind us of all he told us (John 14:26). Today we learn the Way by being open to the urgings of the Spirit in our lives. We open ourselves through our prayer life; by participation in the sacramental life of the Church; by listening to, reading and reflecting on Scripture; by spiritual reading, listening to homilies and spiritual talks; by our participation in faith formation programs; by leading a reflective life; by spiritual direction and/or participation in spiritual support groups; etc. For most Catholics, Sunday Mass, especially the Liturgy of the Word with its Scripture readings and homily, is the normal ongoing faith formation event. Regular participation opens the disciple to a relatively complete coverage of the Gospel stories and events over a three year lectionary cycle. Selections from the Hebrew Scriptures related to those Gospels are also included as is a decent representation of the non-Gospel Christian readings. Our pastor and deacons have committed themselves to preaching in a manner which helps us relate the Gospel to our day-to-day lives and, hopefully, open ourselves to the Holy Spirit’s urgings within us. 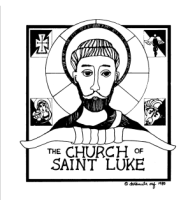 At St. Luke, we also conduct monthly whole community faith formation gatherings called Emmaus. We gather as a community of disciples to allow the Lord to teach us as he taught the two disciples on the road to Emmaus (Luke 24:13-35). Jesus and the two disciples shared a meal to continue their encounter. At our Emmaus gatherings we begin with a meal. After the meal we sing and pray then share in a whole group learning situation that is usually as entertaining as it is educational. Then we break down into age-appropriate groups for more in-depth faith formation. Because we believe in supporting the family as the “domestic church” parents with young children stay with their children and help them complete their learning objectives. Adults get quality instruction in all things Catholic and our youth get programming geared to their stage in life. Afterwards we re-gather as the whole community to share what we have experienced, sing and pray and be sent on our way. For adults, we also have small group bible studies and regular college level courses on Scripture, Church History and Theology. We conduct an annual Parish Retreat to help individuals identify the Lord’s action in their lives, help them listen and respond to the Holy Spirit’s urgings and live out their relationship with the Lord within the community through our Sunday Eucharistic Gathering. The Retreat also helps form Small Ecclesial Communities for those who wish the support of others in their spiritual journey. With our children and youth, we’ve tried to focus additional programming on Scripture. For the kindergarten through 5th grade age group, we instituted Scripture Club to teach the stories of our tradition. Middle School aged youth reflect on the questions of their time in life and then look for what types of answers Scripture provides in order to see how Scripture relates to life in the modern world. Our High School youth learn to reflect in the other direction by looking at the Scriptures from Sunday Mass, that week, and then asking to what situations of their lives it pertains. Our newest offering is Catechesis of the Good Shepherd which uses the educational principles of Maria Montessori and combines a focus on developing children’s natural relationship with God, learning about the Mass and learning about Scripture. We’ve begun by opening an atrium for 3 to 6 year olds and for 6 to 9 year olds with hopes to start a group for 9 to 12 year olds next year. Initially, the result of this effort seems to be that our children have entered deeply into the learning situations and maintain a very reverent attitude toward what they are engaged in. Our youngest disciples seem to be very serious indeed.